Fall Mums Letterhead captures the beauty of Autumn perfectly! 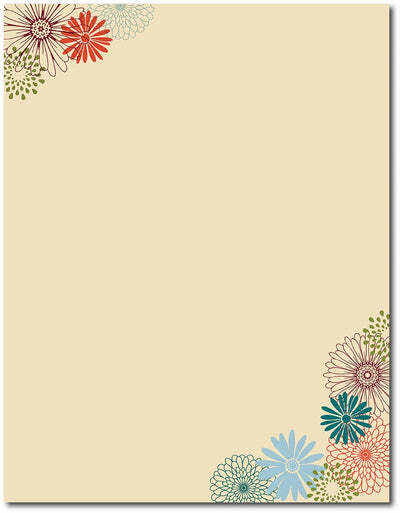 This stationery has a beige background and features modern flat mums in multiple colors on the top left and bottom right of the sheet- leaving the center for your message. Use this Fall stationery to send your Halloween or Thanksgiving invitations & letters! This Fall Letterhead is made from a 50lb Text paper stock that is inkjet & laser printer compatible. Each stationery sheet measures the standard Letter size of 8 1/2" x 11".